With five regular season games left and still, possibly, a bowl game for the 2-5 Vandals, Alfonso Onunwor’s senior season is progressing to the point the University of Idaho’s leading receiver for yards this year can contemplate the end of it. As with many seniors there is the unspoken irony that as he is getting really good at football the chance to keep playing it is coming to a close. “It’s everybody’s dream to keep playing,” he says, and he is open to opportunities to continue to play professionally. But there is the very real possibility the last time he gets to suit up is Dec. 2, when the Vandals travel to Georgia State. Onunwor came to Idaho with an eye-catching resume from Coffeyville Community College in Kansas. 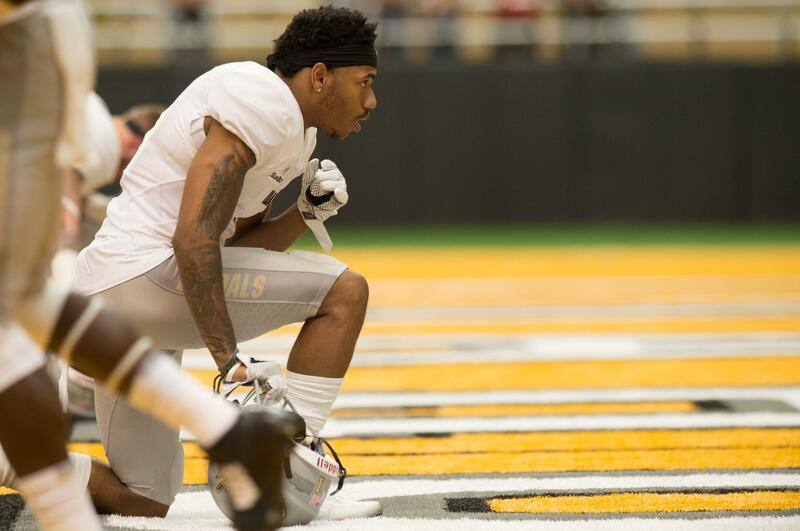 His 75 catches there tied him for second in the nation among junior college receivers, and in his first year with the Vandals he finished third on the team in receiving with 39 catches for 403 yards. Already this year he is leaving those numbers in the rear view mirror. His 31 catches trail only Jacob Sannon’s 40 for the Vandals, and his 445 receiving yards lead the team. This despite missing one game with an injury. “I love catching touchdowns, running routes, being out there on the field,” Onunwor said. Watch him now, he has quick but quiet hands and always seems to catch balls in stride. In practice one day this week he caught a 30-yard fade route for a touchdown from quarterback Matt Linehan. Onunwor half-turned to get the ball as his momentum carried him the other direction, and he wore a cornerback like a shadow. But he still managed to make the catch look as unremarkable as an afterthought. He was lucky enough to have a mentor. His older brother, Ovunda Onunwor, after interrupting his own career as a Division II linebacker to return home to work, resurrected it to join his younger brother on the team in Kansas. It was a valuable if jarring lesson. “He put a time clock in my head,” Onunwor says. Game-to-game, it is a meter that allows him to gauge where he is in relation to defenders. Another clock is also ticking for Onunwor, stirring him to make the most of his remaining time at Idaho. Every senior football player has this timepiece. It marks the end of games. Published: Oct. 26, 2017, 5:44 p.m.